The Hunsbury Hill Farm is the name that our site was first known by when it was built in 1776 by Edward Bouverie shortly after he 'enclosed' the fields of Hardingstone parish. Sitting in 13 acres of land, including 8.5 acres of dense woodland and well tendered English styled gardens, the site is part of a 'Hanoverian' tradition and a rare and unique example of a model farm. A model farm is an experimental farm, which researched and demonstrated improvements in agricultural techniques, efficiency, and building layout. It was designed to serve as a pattern. Education and commitment to improving welfare standards of workers were also aspects of the ideal farm movement. Farm buildings were designed to be beautiful as well as utilitarian – inspired by the ideals of the Enlightenment.. The map on the left is from approximately 1776 and shows the original layout with the Farmhouse at the top. An octagonal grassed courtyard takes centre stage with the Farmhouse, two barns, the larger High Barn and the smaller, more intimate Low Barn, animal sheds and ‘hovels’ wrapping themselves around this focal point. The farm complex was built by Edward Bouverie, along with two smaller farms in the area, to provide food to nearby Delapre Abbey. but the Hunsbury Hill Farm was the biggest and Bouverie's showpiece. There is a drawing of a farmstead in the Bouverie Collection at Northamptonshire Record Office (NRO) by the notable English architect Sir Robert Taylor. It is endorsed externally ‘Plan for a New Farm from Mr Robert Taylor 1769’, (Ref. 2), and is accompanied by an estimate of the same date from builder/architect John Wagstaff of Daventry for a farm described as ‘… for the Honle Mr Bowverie in Hardingstone'. The estimated cost was about £1,200 for the build and it is believed that Mr Bouverie decided this was too much. So he enlisted the services of another architect who was able to come up with a far more satisfactory cost and a layout that just happened to be heavily influenced by the one Sir Robert had designed! 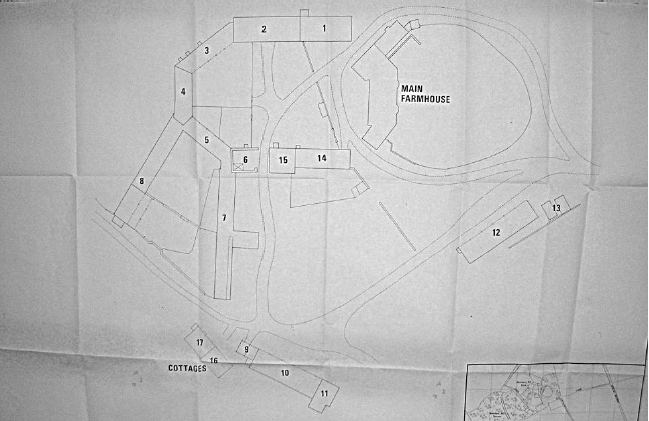 This map shows the layout of the farm as it was in 1976 just before Northamptonshire ACRE bought the site and took over its running. It was a working farm. Farmhouse - now including a number of extensions and renovations added in the 19th and 20th centuries. Farmhouse - the original farmhouse was of three bays, two storeys high plus attics, and with identical single-bay, two-storey wings at either end, aligned at about 30 degrees to the main house. The Hunsbury HIll site has had many owners and tenant farmers over the years, including at one point Phipps Brewery. They purchased the site in 1883 and cut all the oaks down in the woods to make the barrels fortheir beer. They had a number of different occupiers during their ownership, including Harry Griffin, who in 1901 aged 28, a sheep and cattle dealer and farmer took on the tenancy. Harry later married a barmaid, Agnes, thereby causing a bit of a scandal for marrying 'outside of his social circle'! Agnes loved to socialise and would often host parties at the farm. Despite her background, it seems the elite of Northamptonshire found it very desirable to attend these parties, especially as Ivor Novello was often a visitor. Northamptonshire ACRE's offices are based in the Farmhouse and we also run our trading arm, The Barns at Hunsbury Hill, from the Farmhouse.